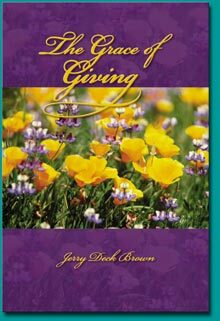 The Grace of Giving brings the benefits of Christian financial and material giving to light and provides specific biblical answers to the many facets of this subject. It shows the Christian what God will do for him or her if the dynamic principles of abundant sharing are closely followed. Biblical support is provided for each topic. The clear cut information that follows will enable any Christian to better understand this issue, and most importantly, follow God’s Will regarding sharing of their own abundance and reap the benefits by so doing. The subject of abundant sharing is a convoluted topic in most religious circles. Much worldly direction is offered regarding how much, when, purposes of, benefits of, and what standards people can apply when giving financially and materially in their church or religious organization. If the opinions, suggestions or imposed requirements do not reflect what the Bible teaches, these reflections may cause Christian people to err. The Grace of Giving is designed to establish exactly what the Bible does say about this subject, clarifying it to those who believe the mighty scriptures. 1. Christians and the Old Testament Tithe? 3. Giving standards in the Christian church? 6. How to walk into a life of abundance? 7. Leadership responsibilities regarding abundant sharing. 8. How, when and where to abundantly share? 9. Good works as compared to abundant sharing? 10. Agape love and how it applies to abundant sharing? 11. What did Ananias and Sapphira do that was deserving of death? If you have questions regarding any of these topics, The Grace of Giving will provide you with solid, biblically supported answers. Abundant sharing is one of the greatest ways to unleash God’s grace in a Christian’s life, bringing the awareness of God’s favor clearly into focus. These powerful principles will enable anyone interested in walking a life of abundance to do so. Christians, potentially, can be the most giving people on earth. When each person accepts the invitation into the grace of giving, the greatness of this action will grow into a flourishing movement of God’s Word. Truly, a new light is shed on the service aspect of a minister: the light of overseeing the administration of abundant sharing in the church. As Christian leadership allow these truths to sink into their hearts, they move closer to a mature lifestyle of the grace of giving. For those who faithfully abundantly share, God’s grace takes a new form, evidenced by the person having all sufficiency in all things. Abundant sharing is of as much mainstream importance as is forgiveness and the resurrection, topics also taught throughout the New Testament. Christ within, combined with knowledge of God’s Word, enables all Christians to perform good works according to God’s desire.